When we're first introduced to young James, he's just started boarding school at Eton in the 1930s. His first adventure is set in the Highlands of Scotland, where James spends a holiday at a remote castle. Mysterious things start to happen, someone has disappeared; then James discovers that the dark waters around the castle contain a sinister secret, and he becomes aware that a very dangerous mind is at work. SilverFin is the story of Young Bond's first mission to thwart a deadly foe. Acclaimed British writer Charlie Higson has written a brilliantly crafted tale that ingeniously uncovers the unknown story of a boy who became one of the most iconic figures of our time. Commissioned by the Ian Fleming estate, SilverFin is an edge-of-your-seat thriller that will mesmerize listeners of all ages from the very first minute. I've been told repeatedly by fellow 007 fans that I needed to read this series. I'm not really sure why I'd not done this before, but I'm glad I finally picked this one up. I am truly impressed with it! The best way to relate it to the Bond we know is to compare it to the TV series The Young Indiana Jones Chronicles. It's the same kind of thing, where you can see the elements that would turn the kid into the man we know. And in this case, the man we know is definitely Fleming's Bond. The setting is in the early 30s when Germany is only beginning its rise to power, and young Bond is still in school, learning to drive a car, and facing off against the local bullies. In this case, the local bully's father happens to be into eugenics. What are the odds? There are plenty of nods to both Fleming and to Connery to make this enjoyable without going overboard with it. And as a bonus, the narration provided by Nathaniel Parker is a first class performance at all turns. Even when the story isn't so credible, Parker makes you believe it. All in all, a solid beginning. I'm looking forward to more! My 12yo (and rabid Bond fan) son and I listened to this on a recent roadtrip. I have to say it was a hit with both of us... a good introduction for young Bond fans who may not be ready for the "Full-Flemming". We look forward to grabbing the sequel from Audible when it is available! FYI - Another good 'starting Bond' is Thunderball - similar to the movie, straight forward, minimal graphic content. Enjoyed every chapter. And the narration was first rate. very well done. If you like Bond, you'll enjoy this first adventure. We wished there was less swearing. Narrator is the best. Nathaniel Parker should narrate my life. 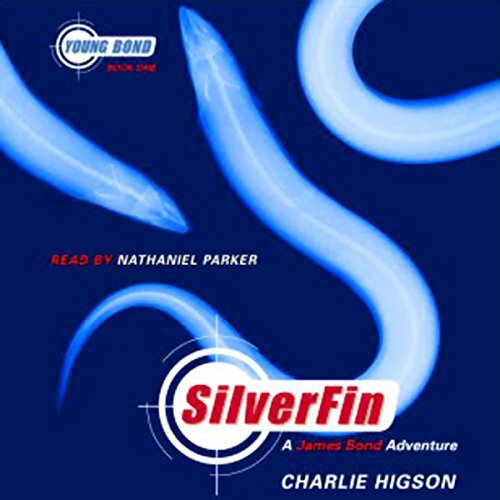 I read all of the original Bond books and decided to try Silver Fin. I didn’t think it could possibly be as good and didn’t go in to it with any expectations. Not only did I find it to live up to the caliber of the original novels and stay true to the character of James, but it was actually more fast paced and a higher percentage of this book depicts Bond being in peril. Narrator was pretty bad with his different voices. Grandson lost interest after1st chapter was over. Given, I've been searching and searching for books he will listen too as he loves spy stuff, but he didn't like this...and he is the audience. I actually liked the story line, but I'm not the audience. Who would you have cast as narrator instead of Nathaniel Parker? I don't know...Grandson liked Stormbreaker and Nathaniel did that one too, so I'm not sure where that leaves me. I liked Nathaniel in Stormbreaker too, but not this one. Do you think SilverFin needs a follow-up book? Why or why not? I think most books in this genre need a series. I'm sorry I'm so much trouble, but I'll keep trying until my Grandson is happy. This is an excellent, thrilling story. And... what an incredible narrator. if you like Alex Rider, you will enjoy this! So this takes place WAY before Bond was Bond. This is a school boy on an adventure who just happens to be James Bond. It's interesting though because as slow as it starts (why I didn't give it 5 stars) it really does develop into something nice. I think the lessons, experiences, and mentoring moments in this story translates well into the foundation for James Bond. It's pretty fun, if a bit slow at the start. It wraps nicely and I'm interested to follow this to the next in the series. Listening to Nathaniel Parker made the story sound British. Always love a good Bond adventure. Would you consider the audio edition of SilverFin to be better than the print version? What was one of the most memorable moments of SilverFin? Have you listened to any of Nathaniel Parker’s other performances before? How does this one compare? No but it was entertaining for a long drive.